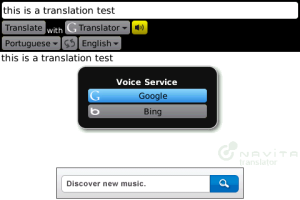 I’m all in favour of translator apps – and this new addition to the Blackberry store has a few features that make it stand out from the pack – voice translation; support for 50 languages and integration with email and SMS messages. The translation engines used are Google and Bing so the accuracy will be as good as it it on those websites. I’d be surprised if voice recognition one works very well – given that inaccuracies in computer translation will only be compounded by the inaccuracies in voice recognition – but it might be useful for getting the gist of what people say. While it doesn’t have have Augmented Reality bells and whistles like the recent Word Lens for iPhone, it looks like a solid fully-featured translation app.